Coiba National Park is an important place for the survival and study of many species of fish and marine mammals. 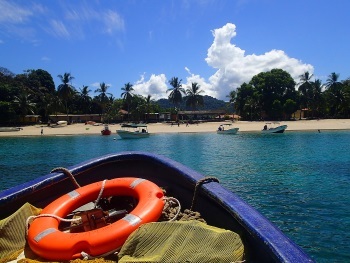 The park protects Coiba Island, 38 smaller islands and the surrounding marine areas within the Gulf of Chiriquí. Coiba Island is covered with primary forest, one of the last relicts of tropical moist forest in the region. It has many (endemic) birds. The marine zone is home to 760 species of fish, 33 shark species and 20 cetacean species. After Coiba got disconnected from the mainland (some 12,000 years ago), new fauna and flora species are being formed, turning the island into a scientific laboratory. I had the pleasure of spending an entire day surfing some of the most beautiful and untouched breaks of Coiba in the summer of 2006. After about an hour and a half boat ride from Santa Catalina, we arrived on an uninhabited paradise of jungle reaching down to the beaches and cliffs aiming towards the heavens. We explored many of the point breaks and did a bit of snorkeling near a few reefs sheltered from the larger waves arriving from the south. The highlight of the day trip including a two hour session surfing on the west side where I spent the majority of my time observing the Scarlett Maccaws flying overhead and landing on the beach only feet away! Be advised though, this island is nature at its finest and most untouched, which comes from my observation of several large shadows circling underneath my board at one point in time... My guess, bull or whitetip sharks investigating the strange creatures that had stopped by for a visit and to take in the wonders of this gorgeous island! Prison: The penal colony still operates! Archipelagos: Coiba NP consists of 38 islands which make up an archipelago.